CAJAMARCA, Peru, April 20, 2012 (ENS) – Thousands of Peruvians protesting in the streets of Cajamarca against a proposed gold and copper mine say they will contine their demonstrations every day until the government rejects the development. They fear the surface open pit mine would pollute their water supplies and destroy the region’s environment. The object of their anger is the Conga Project, located north of the Peruvian Andes 73 km (45 miles) northeast of the city of Cajamarca, at elevations ranging from 3,700 to 4,260 meters (12,140 to 13,980 feet). The mine would straddle two provinces, Cajamarca and Celendin. The project is proposed by Minera Yanacocha, which already has a giant open pit mine in the area that has polluted water supplies with mercury, among other toxics. Minera Yanacocha is a joint venture of three partners: Compañía de Minas Buenaventura of Peru, Newmont Mining Corp. of Denver, Colorado and the International Finance Corporation. The Conga Environmental Impact Study, prepared for the Peruvian government by Knight Piésold Consulting, identifies the resource as 3.1 billion pounds of copper and 11.6 million ounces of gold to be extracted over 19 years. Concentrates would be trucked to Salaverry port on Peru’s north coast for transport to international markets. 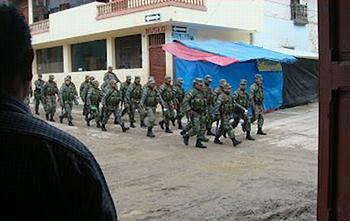 After numerous demonstrations throughout April and a regional strike on April 11, organizers of the Cajamarca protests Wednesday declared a “permanent control conference,” with daily demonstrations and vigils, and public forums aimed at convincing the government of President Ollanta Humala to deny a permit for the new mine. The protests continue despite the presence of police and military forces sent by the government to control demonstrators in the regional capital and other locations affected by the Conga project. 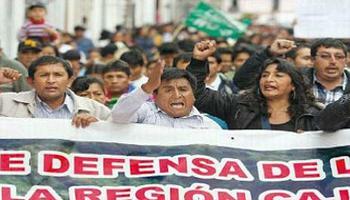 In Cajamarca, a rally in the Plaza de Armas Wednesday drew an estimated 10,000 people. There, Idelso Hernandez, president of the Front for the Defence of the Interests of Cajamarca, said the protests will continue at least until President Humala comes to Cajamarca to talk to the residents. The final decision on the $4.8 billion Conga project will be made by President Humala. At a news conference in Lima Wednesday, Environment Minister Manuel Pulgar-Vidal said the government has set no firm date to decide the future of the project. The minister said the decision will be a political one taken after ministers review a special technical report prepared by three European experts hired by the government to assess the Environmental Impact Study. He said their report proposed “substantial improvements” to the EIS. On the streets of Cajamarca, the protesters objected that such an evaluation is not the solution to the conflict, which has stalled the Conga project since last November. Wilfredo Saavedra, president of Environmental Defense Front Cajamarca, demanded that President Humala deny a permit for the mine. “We know that audiences are manipulated, we no longer believe in the executive, so whatever happens with the technical report of the experts will not run Conga,” he declared. 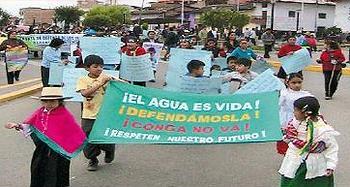 Five high mountain lakes would be affected by the mine, according to the EIS: Chailhuagón, Perol, Mala, Azul, and Chica. Water from these lakes runs to the Marañón River, a tributary of the Amazon River flowing into the Atlantic Ocean. Local residents have already set up camps at three of the lakes. 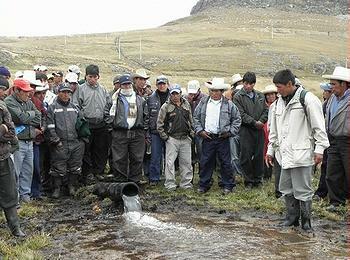 Groups of people from Cajamarca are traveling to join about 2,000 people encamped at the lakes as “guardians” for surveillance and protection of the water bodies that are essential for their agriculture and livestock.